Theft And Artistry: Coldplay, Beyonce In India Spark Discussion On Appropriation These days, it's pretty much impossible to miss a discussion on cultural appropriation. But we explore where we draw the line between what's acceptable and what's downright offensive. 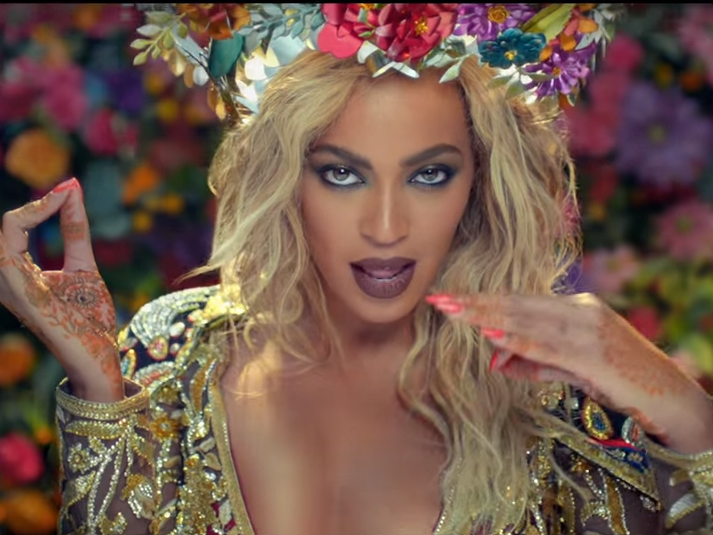 Beyoncé in the video for Coldplay's "Hymn for the Weekend." Here's what we know: Coldplay and Beyoncé will perform at Sunday's Super Bowl halftime. The duo just released a song called "Hymn for the Weekend." But they won't be performing it — because it's too new, according to the band. "I don't think it would be quite right," said frontman Chris Martin, according to The Associated Press. The decision comes as the song's music video has ignited a heated debate about cultural appropriation. The video, which uses India as a backdrop, has drawn a focus on where where we draw the line between what's acceptable and what's offensive. Recently, the debate over cultural appropriation hasn't been very hard to find. Just look at the top of the pop charts, right now. At No. 2 on the Hot 100 is Justin Bieber's "Sorry," a song that takes inspiration from Latin-American reggaeton. Bieber dropped that single in October, and just as quickly — and thousands of miles away in Chile — a blogger called him out on it. "The new single by Bieber is a tutorial from Skrillex on how to make reggaeton for white people," Maximiliano Jimenez wrote. Jimenez runs a runs the pop culture site Pousta and he said the song is a type of cultural colonialism. "The music business sees Latin America and this kind of music as an inspiration to make more money," he said. Greg Tate, a musician who wrote a book about appropriation titled Everything But the Burden, says it's more complicated than that. He says there is a key tension in any conversation about appropriation: First there is an artists' desire to receive credit for their work — whether monetarily or artistically — and then there's the fundamental relationship between art and theft. "Your training as an artist is essentially about impersonation, imitation," he said. "You learn to get better by kind of borrowing or adapting or training yourself in the way of the people who came before you." In a lot of ways, that's why we keep having this conversation. We had it in the '60s when George Harrison included a sitar in Norwegian Wood. And then 20 years later, Paul Simon released Graceland, a lush album in which Simon reworked South African songs. In an interview with World Cafe in 2012, Simon said that his intention wasn't to document the plight of black South Africans suffering under the oppression of Apartheid. It wasn't even to bring their music to the Western world. Instead, he said, wanted to make a good album. "My idea was, they play their best, I'm going to play my best," he said. "And that was my way of saying that I thought that they were extraordinary." At the time many of the black musicians who played and sang on the album said they were happy with the collaboration in part because it had brought South African music to the global stage. The legendary South African musician Jonas Gwangwa was one of the few dissenters. As The Guardian tells it, when he heard someone praise Simon for shining a spotlight on South African music he replied: "So, it has taken another white man to discover my people." Since then, there have been many more examples. From the obvious: Katy Perry in cornrows and a Taylor Swift video filmed in an entirely white Africa. To the more complicated: Shakira, a Latina of Arabic descent, belly dancing and Macklemore acknowledging the theft of black culture in a nine-minute song that exploits the very thing he's railing against. Nitasha Tamar Sharma, a professor at Northwestern University who studies hip-hop, says she's not that interested in talking about when appropriation is right or wrong. She's not really interested in talking about why Eminem is controversial but Adele, who borrows from the tradition of soul, is not. She said ultimately what she thinks is important is the effect that thoughtless appropriation — perpetrated by anyone regardless of color — has beyond culture. When we're presented with caricatures of other cultures, she says, it's easier for people to view them as sub-human. It's easier to pass unfair economic policies, for example, or even to start a war. "I think when people of color and dominated groups just become a backdrop with no voice and context, no humanity," she said, "I think that's the problem." That's what the video that goes along with Bieber track accomplishes she said. "For the most part, [the women] are just props: scores and scores of generally undifferentiated women," she said. The message he's sending is that "he is drawing from Black and Brown cultural formation (with the track and the dances) absent the full presence of Black and Brown people and can do it just as good as they can." Sharma said the same can be said of the Coldplay and Beyoncé song. Indian culture, she said, is presented with the same old stereotypes and it is relegated to a background. Tate, the musician, has a much similar criticism of the song. "It's just seems so damn corporate," he said. "Something that a Duran Duran might've done in 1985 and that just makes it mediocre." However, Tate said, the discussion on appropriation is necessarily subjective, so he chooses to subscribe to the wise words of Public Enemy's Hank Schocklee. "He said the only question that matters is whether or not it's dope," Tate said. "They may be offended but at the same time, they'll just have to admit you made something that works." The bottom line, he said, is that the Coldplay/Beyoncé collaboration is not dope.